...He has, of course, pictured her naked---just as he has pictured all of his students naked at one time or another, usually from the back of the room while they are giving a presentation...This is the great secret of all the teachers at Carmin-Casey and, Binhammer is sure, all the other high schools, public or private, in the world: there is a massive naked cocktail party going on in the head of every high school teacher. Everyone thinks that teachers are like doctors, immune to the sexual charms of their clientele...In fact, Binhammer would be willing to bet that doctors are not like doctors. 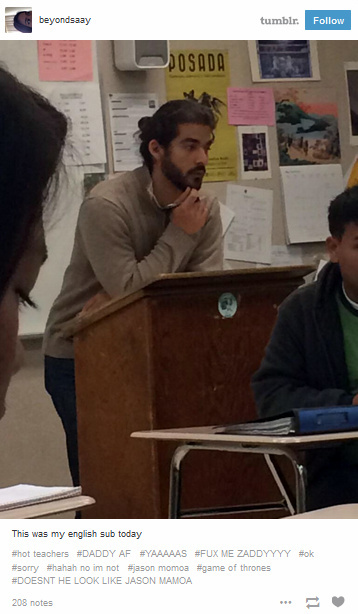 A recent controversial post on BuzzFeed shows that the fantasizing can be mutual and that (some) students daydream about their teachers from the back of the classroom as well. 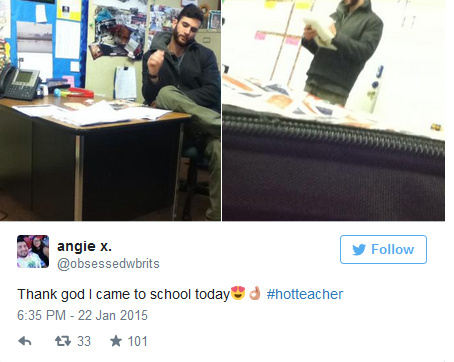 BuzzFeed's top post with over three million views titled "13 Really Hot [High School] Teachers That Will Have You Begging For Detention. Yes, Mr. Smith. I’ll gladly stay after class" displays a number of photos taken by high school students of their "hot" teachers that were posted to Tumblr, Instagram, Snapchat and Twitter. The hashtags are just as interesting as pictures e.g., #Hot teachers, #teacherxstudent, #forbidden, #one sided love, #older men, #high school, #DADDY AF and #FUX ME ZADDYYYY. 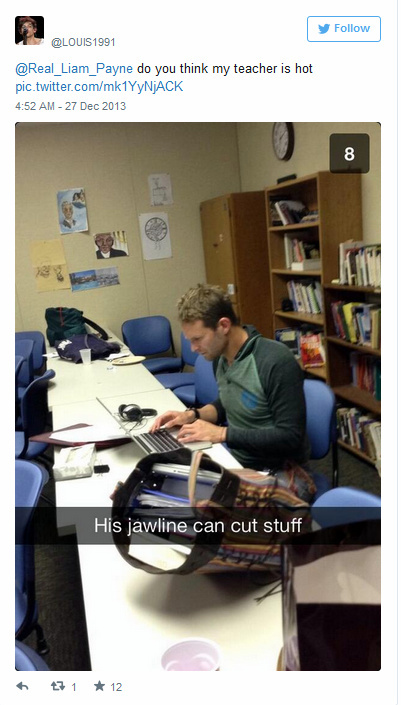 College girls have a more sophisticated way of showing their attraction to their professors. On the popular website Rate My Professor, coeds can post a subjective review of their professor's teaching abilities along with a chili pepper that indicates how "Hot" the professor is. Thus, it's not surprising that novels, television shows and films like ttyl, Pretty Little Liars, MTV's Scream and Molly Maxwell (2014) are so popular with nymphets. The likelihood that these feelings, comments and hashtags will be directly revealed to some, if not all, of these teachers is very high. But we at the Allure of Nymphets advise them to use the fact that they're teachers as a barrier to committing crimes and/or ending their careers. As the narrator in Hummingbirds advised "The fact that he is an educator entrusted by the parents of the community not to molest their children, even if those children ask to be molested [should serve as a barrier]."